Reconstructed woodhenge near the East Entrance at Knowth. This structure is thought to date to about a thousand years after the big mound. The passages of the huge mound appear superficially to be aligned to the equinox sunrise and sunset, one opening towards the east, the other to the west. 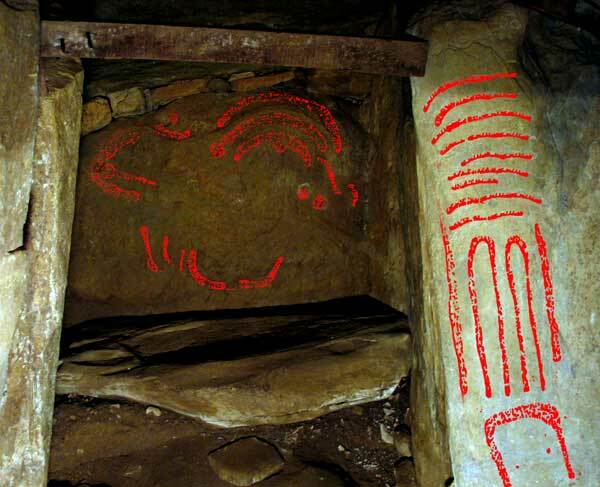 However, apart from the work of Martin Brennan in the 1970's and early 1980's, and Philip Stooke in the 1990's and discussions of internet groups, little concern has been shown for any possible alignments at Knowth. This is quite surprising, given the obvious interest in astronomy shown at Newgrange, just 2 kilometers away from Knowth. The end recess of the East chamber at Knowth; the photo is looking west. 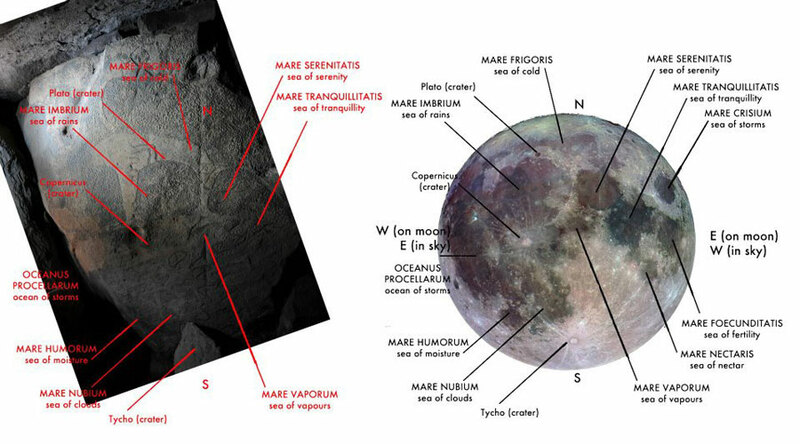 Canadian researcher Philip Stooke has suggested that the engravings (highlighted, center) are the oldest known diagram of the moon. Both of the Knowth passages have standing stones outside them, which cast shadows on their respective entrance stones around the equinoxes. The entrance stones have vertical marks engraved on them as with Kerbstones 1 and 52 at Newgrange. The entrances to both large passages were extensively disturbed in the Iron Age when the mound was fortified, so we don't know if there were any roofbox structures, or other astronomical features. The shameful blocking of the entrance to the east passage, during the OPW conservation and reconstruction, with a slab of concrete makes it impossible to visually check any alignment with the equinox. Though it is difficult to get an exact measurement, it appears that the passages are not aligned due east and west. The east pasage is oriented to about 83°, perhaps a week after the spring and before the autumn equinox. 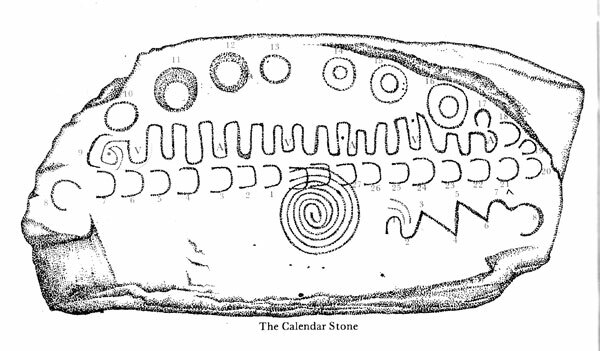 Martin Brennan's illustration of a kerbstone with lunar symbols. The west passage is also a week to 10 days off the equinox sunsets. The west passage has a 'kink' about three-quarters of the way in, which is probably the remaining section of an earlier chamber which was altered and realigned during the construction of the great mound. Design on the interior of the huge basin in the east chamber. Drawings by Martin Brennan. 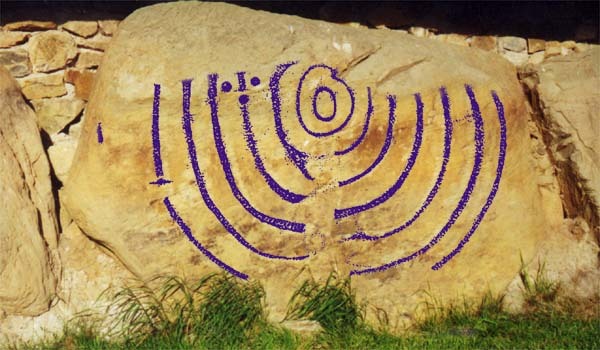 Knowth has a wealth of lunar symbolism, and more recent research - mainly on internet discussion lists - tends towards lunar alignments and cycles being the main focus at Knowth. The mounds of Knowth viewed from across the River Boyne. The 17 or 18 satellite mounds suggest the 18.6 year lunar cycle, which seems to have been of great interest to the ancient Irish and was studied at Cairn G in Carrowkeel. Kerbstone at Knowth with art by Martin Brennan superimposed. The satellites more than likely aligned to different phases of the moon, and used over a lengthly period of time before the main mound was built. Site 2 and Site 4 look as if they may be aligned to summer moon rises and extreme summer rises, and Site 2 has a specific solar/lunar engraving in the right-hand recess. The art at Knowth seems, to me, to speak for itself when it comes to lunar motifs. Moon map at Knowth © Padraig Conway. My own guess - which follows Brennan - would be that at certain times, at least twice if not four or eight times during the 18.6 year lunar cycle, the chambers of Knowth's main mound are lit by both the sun and moon at the same time. This is indeed be a feat which would match the size, scale, cosmic grandeur and design of Knowth. This grand double alignment specifically fits with the design carved within the great basin stone from the east chamber, above. 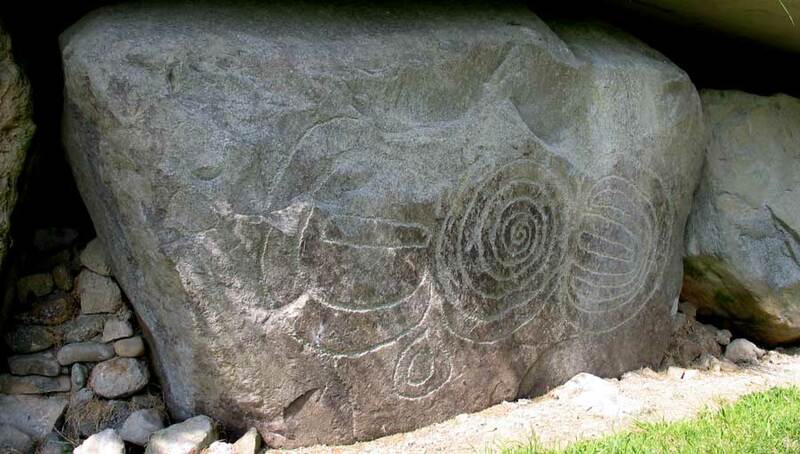 Kerbstone at Knowth with the engraving overlaid with one of Martin Brennan's drawings. 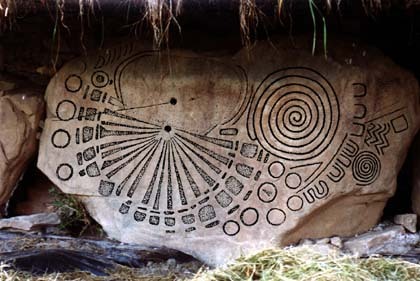 Many of the engravings at Knowth suggest orbits. The possible lunar alignments at Knowth are supported by research from Philip Stooke, who has identified the engravings on the keystone of the east chamber as the oldest map of the moon so far discovered, illustrated near the top of the page. You can read his paper on the subject HERE. A long, thin stone, with a groove along one side and ribs along the other, terminating in a headpiece with three engraved ovals. The stone was found near the entrance to the west passage. Generally called a phallic object, it may have been used as a sightpiece for making astronomical observations, a measuring device or as a holder for a stringed pendulum. From the book, Knowth by George Eogan. Carving on the front of the great basin in the East Chamber. This carving on the front of the great basin may represent the orbit of a heavenly body, perhaps the earth around the sun. 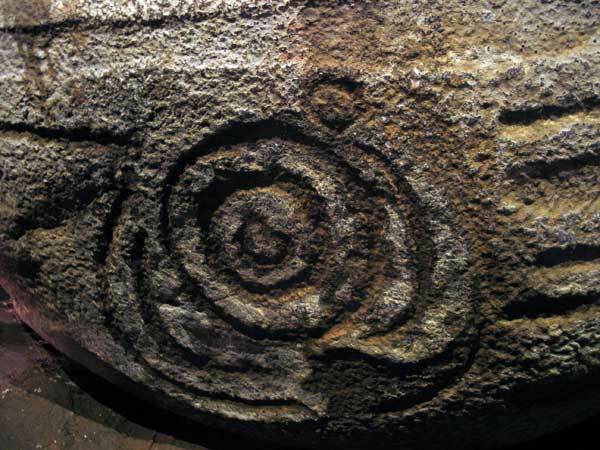 It also resembles the fine carving in the right hand recess of Cairn L at Loughcrew. There are seven deep grooves running around the outside of the basin. Sadly, the modern restoration work at Knowth means we have to guess what was going on. The damaged entrance to Knowth east may well have had a roofbox structure similar to Newgrange. The east passage of Knowth is said to be oriented to the third great mound at Dowth. This kerbstone is thought by Martin Brennan to represent the moon in it's various phases. It is located not far to the north of the east entrance.